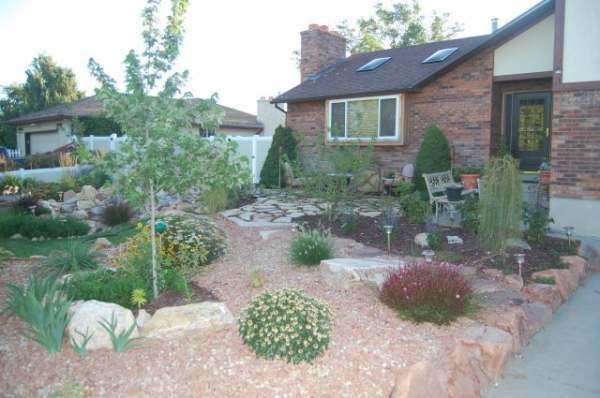 Welcome to our xeriscape ideas picture gallery. Xeriscaping is quickly becoming more popular as concerns about water consumption continue to rise. Before we get into the xeriscaping pictures, Dream Yard has over 200 pages of helpful landscaping articles, how-to's, and tips if you are new to the site. You can see what we have by viewing our site map. We also have over 16,000 landscaping pictures on Pinterest. Click on the follow us button found on our home page and throughout the site to join nearly 200,000 others that find inspiration for their dream yards. 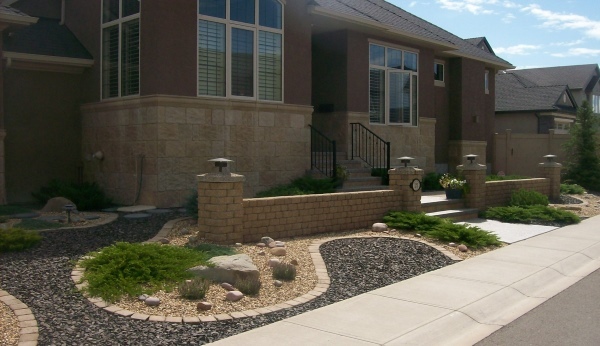 So xeriscape landscaping is a "type" of theme that imports many of its features from desert landscaping. It is a way of landscaping that lowers or eliminates water consumption using plants that have low water requirements and reducing or eliminating lawns by using alternative ground covers. Small sloped front yard with low maintenance shrubs. A gravel bed of crushed rock flows out to the street like a river from the front stone steps. 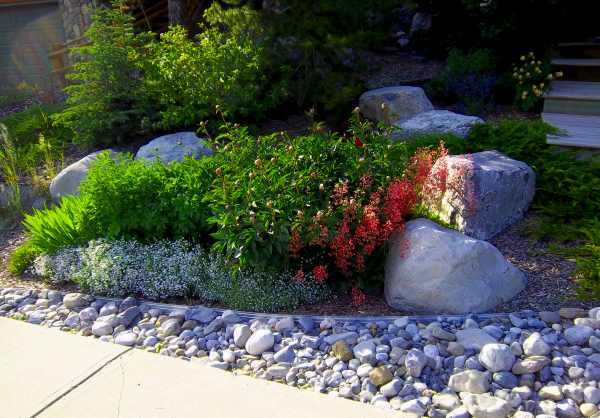 This xeriscaped front yard can be made easily and affordably. This is done with simple landscape bricks and decorative rocks that makes for a nice contrast, while adding in some plants can give it colour. This reduced lawn using alternative ground covers is a great way to lower water consumption. A nice front yard patio makes for a friendly and welcoming home. and very easy to maintain. 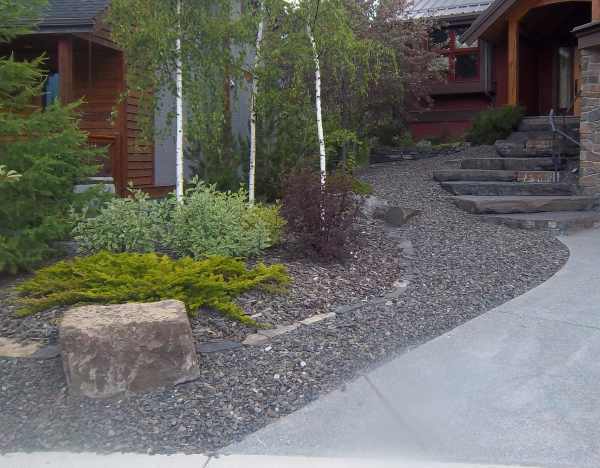 Front yard river rock landscaping ideas are easy ways to eliminate maintenance. 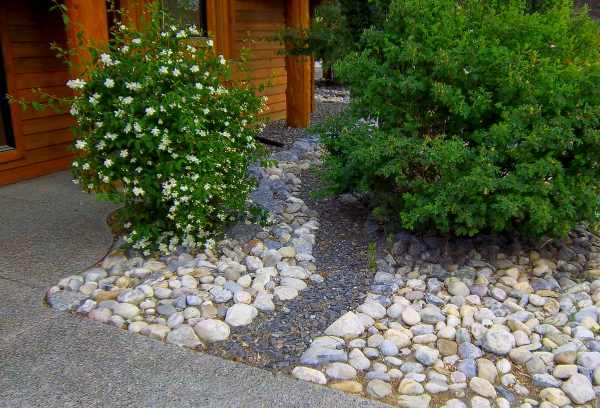 Adding a small gravel river bed is simple way to dress up this simple design.